A standing desk is a quite beneficial tool if you are going to spend a lot of time in front of your computer and want to burn some calories instead of becoming a ‘couch potato’. IKEA offers many opportunities to its customers to make their own DIY standing desk, without spending a fortune on it. 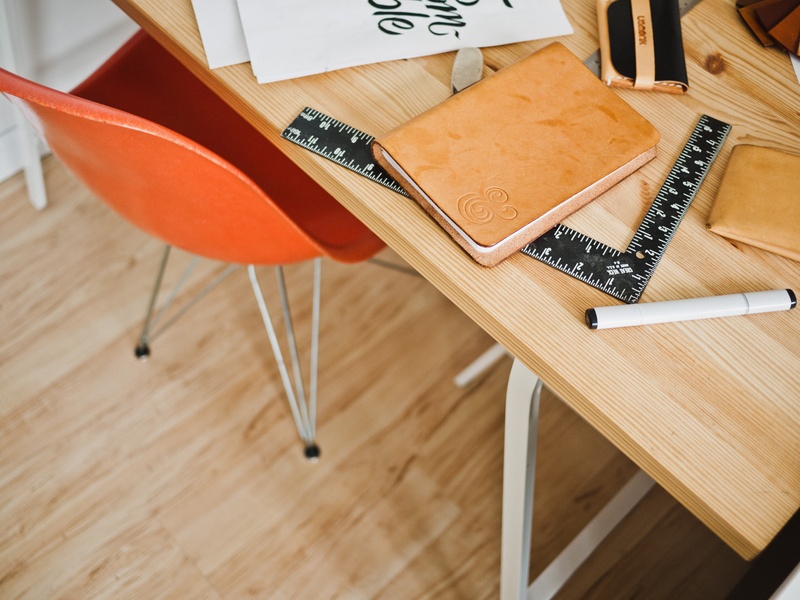 In this article, we are going to round up some of the best IKEA DIY standing desk ideas, with mention of the IKEA parts being used. It may interest you to know that IKEA used to make its own out-of-the-box standing desk called the Jerker. However, currently, the desk sale has been discontinued by the company. Hence, we are left with the DIY options. Let us now get started with the first option. 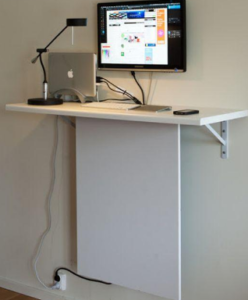 The bar table standing desk is one of the simplest options in our list. It requires an Utby table frame, which goes 120 cm high, and a complementing table top. This is a great choice if you are of an average height and have a modest budget. Your result would look similar to the table in the picture above. (You can even buy a manufactured IKEA bar table). A wall mounted standing desk is a great choice if you live in a small apartment, where each meter is precious. This design is very pragmatic and functional. 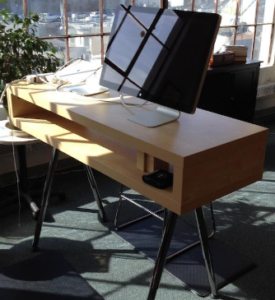 You can mount the desk according to your height and convenience, making it uber flexible. The IKEA Norbo wall-mounted table is what you should get to implement the idea. It is recommended that you mount the monitor on the wall, instead of keeping it on the desk, to clear up even more space. 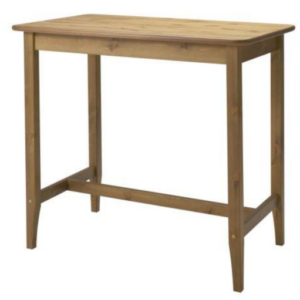 The drop leaf style of the table will allow you to open up space when you are not using the desk. Perhaps you are a beginner and are looking for just something unsophisticated. Well, this option might do it for you. You need a lack TV unit and a frame desk legs. Once, you have your supplies, just make the frame and attach the lack unit. Voila. You now have a unique standing desk. The size of the A-frame legs can be adjusted according to your height. Also note that you need to drill holes to attach the frame legs, but it should be simple enough. This is a great option for those DIYers who go crazy for aesthetics. The lagan counter top will hide away all the jumble of ugly wires and give a minimal look to your standing desk. It requires a simple IKEA board and lagan counter top. First, you need to attach the counter top in a position which suits your height. Then glue on the IKEA board under the counter top. Now you have a beautiful standing desk that keeps your place looking neat. 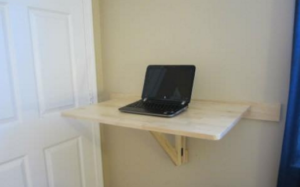 To be frank, the sky is the limit when you are doing a DIY project for standing desk. If you can think of it, you can make it. While for beginners it is recommended that you stick to the mentioned instructions, regular DIYers can spice up these options with a bit of their own creativity!